Welcome back! Today I want to share a bit more about Maureen Cracknell and her gorgeous work. If you haven’t yet read it, part one of this interview was posted here yesterday. When I spoke with Maureen last week I became intrigued by her stories and her developmental process as an artist. What most impressed me though, was her humility. She spoke with such a genuine tone and it was incredibly easy to have a great conversation with her. I asked her to talk about what inspires her when she is working on a line of fabric and she told me some wonderful stories. It seems that sometimes, drawing, painting and then designing a line of fabric is very therapeutic for Maureen; it is a way to process and work through a life experience. She shared two of these stories with me. The first one was when she designed her very first collection, Wild and Free. This was the first line Maureen designed for Art Gallery Fabrics. Her mentor, Pat, had been encouraging her to take the step and design a line of her own. However, Maureen held herself back by worrying it ‘wouldn’t be perfect’, that maybe her work would be only ‘mediocre’. She was afraid to put herself out there and kept saying she wasn’t ready yet. In June of 2013, Maureen’s father passed away. This was a time of intense grief, as one would expect. Out at a restaurant, sharing a meal with her family, Maureen ran into a friend of her father’s. He was expressing his condolences to her and he asked her if she was designing fabric. Maureen was somewhat taken aback and replied no, she was not. This friend told her that her father had mentioned Maureen would be using her artistic skill to design fabric. Her father told this friend that he was so very proud of her and knew she would do well as a designer, that he was proud she was going to be ‘making fabric’. This conversation between her father and his friend stuck with Maureen and she took it as a message from her dad that she could indeed do this. At about the same time, Maureen received a call from her mentor, Pat Bravo. 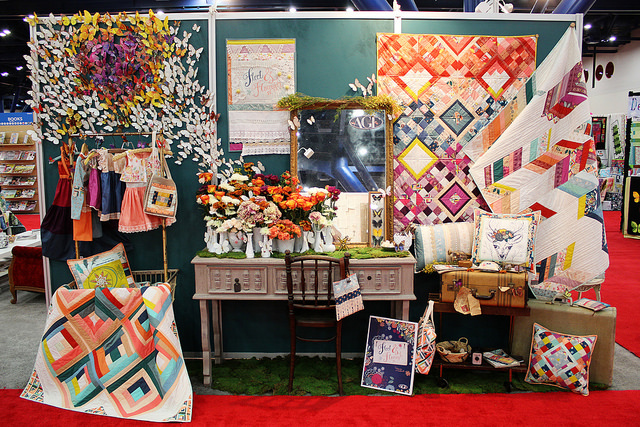 They talked and Pat mentioned that the whole Art Gallery booth was ready for the upcoming Fall Quilt Market show. She said they were only missing one thing. Maureen, of course, asked “what is that”? Pat’s reply was, “you, we are missing your fabric”. Maureen was blown away and this was just the gentle push she needed to jump in and begin. In Wild and Free, Maureen used drawings she already had as well as new pieces of art to create the line. There is even a design based on drawings she made with her children. 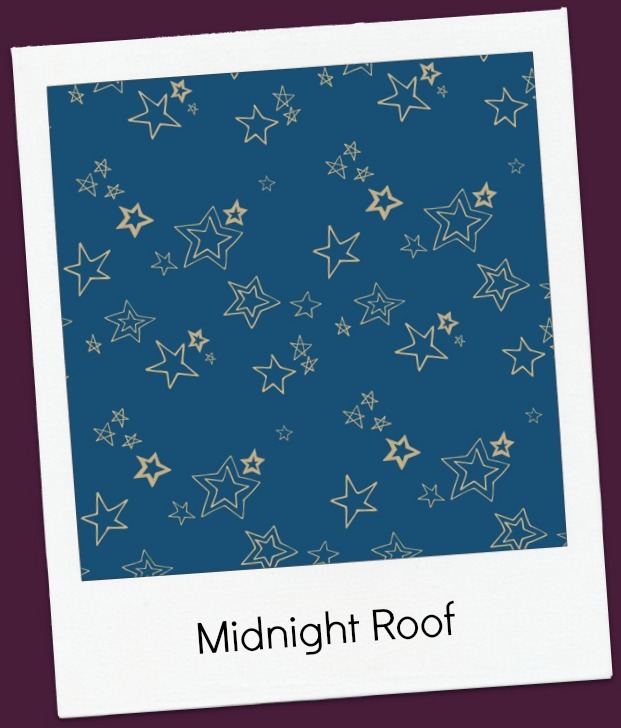 The star fabric, Midnight Roof, is one of these. This simple blender is based on a game Maureen often played with her children where she would draw a line and then the child would add a line. They continued this back and forth sharing and together, they would create stars. She and her children also played this game to create hearts (with each person drawing half of the heart) as well as portraits where they each add to the portrait, turn by turn. When Maureen agreed to jump in and start designing her own line, Pat generously made herself available to Maureen, teaching her how to use Illustrator for design purposes. They had many Skype sessions with Pat guiding Maureen through the design process as well as teaching her to use the software. Not long after they began, Maureen’s first line, Fleet and Flourish, was displayed in the Art Gallery Fabric booth at Quilt Market. Maureen won Best New Exhibitor that year! What an amazing start to her career as a designer. The next story is as heartwarming as the first! The current Maureen Cracknell line that is flooding quilter’s stash everywhere is Garden Dreamer. It is just a fantastic collection of florals, both large scale and small, with shades of greens, blues, corals and purples. Truly a gorgeous line of fabric, she told me the story of how it came about. I think the emotion Maureen pours into her work translates to beautiful color and composition. Her fabrics are full of joy. I asked Maureen whether she had any input into the adorable selvages that Art Gallery puts on her fabrics. She explained it was actually up to the in house designers at Art Gallery. They design her promotional materials as well as the beautiful selvages. I don’t believe I have bought a piece of fabric just to get the cute selvage, but it is a fun bonus to see a pretty selvage trimming the fabric I bring home. Art Gallery for the win here! 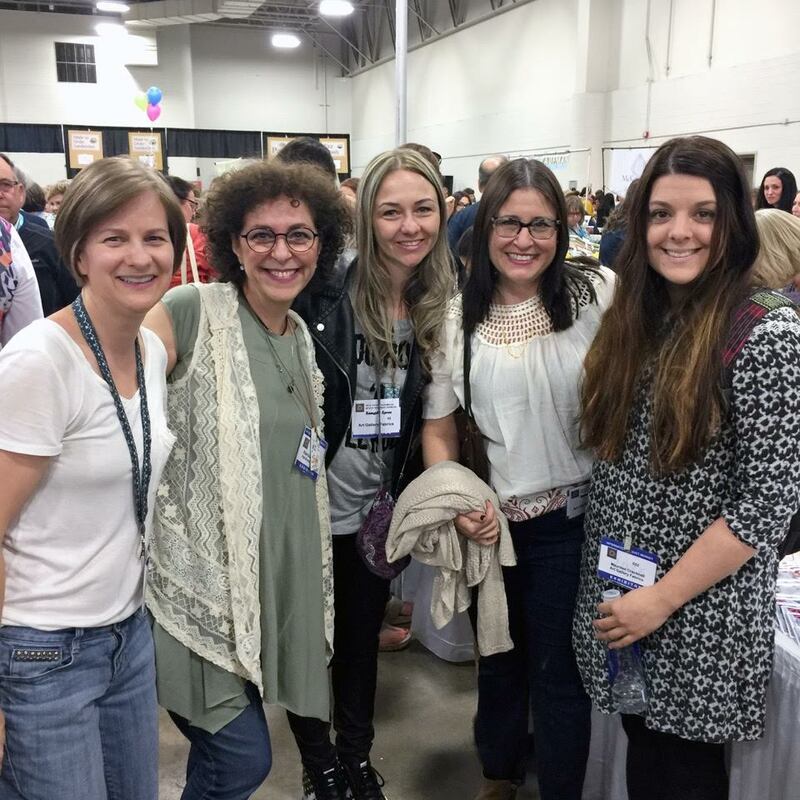 We had a nice time reminiscing about her experiences at Quilt Market as a part of the Art Gallery team. It was heartwarming to hear the love Maureen has for her partners at Art Gallery. She is both indebted to them for all she has learned from them as well as invested in the company as a loyal member of their team of designers. She spoke about the way that Art Gallery fosters an environment of collaborative teamwork. I want to interject here. My experience thus far with Art Gallery as a new shop owner has been superb. I have called numerous times with questions on process, delivery dates, shipping cost, etc. Each time I have been greeted with warmth and a kind hello. Sometimes I find myself talking with a knowledgeable customer support person and other times my call is taken by none other than the owner, Walter Bravo. He treats me with as much attention as he would a large operation; I am never made to feel less important because my orders are usually five bolts at a time. This impresses me deeply. Prior to retirement, I managed a Human Resources group for quite a few years. I know first hand the benefits of fostering an atmosphere of teamwork and collaberation within a group of employees. The team becomes like a family and the positive effect of this trickles down and is felt by customers, thereby increasing their loyalty to the company. I am an example of this. I am proud to carry Art Gallery Fabrics in my shop. Being the curious sort and not wanting the conversation to end, I also asked who makes the decision to make her fabric into the usual gorgeous cottons that Art Gallery produces as well as knits, canvases, voiles and, soon, rayon fabrics. This is a collaborative decision made by the designer and the team at Art Gallery but the head designers have the final say. I am happy to see the other types of fabric offered as it allows for so many different sorts of projects. Art Gallery does an awesome job with their lookbooks. If you haven’t taken a peek, it is worth your time. There are samples of everything from home decor, quilts, dresses, skirts, totes, bags, pillows and more. Free patterns are offered on many of the examples. If you want to see the book for Garden Dreamer, click here. I hope my posts have given you a peek into Maureen’s work and creative process. I feel like I made a new friend after chatting with her and I am grateful for that. As I mentioned yesterday, Maureen’s Garden Dreamer fabric is on sale through Sunday, March 19th. Save 15% this week only. No coupon code needed, prices are already adjusted. 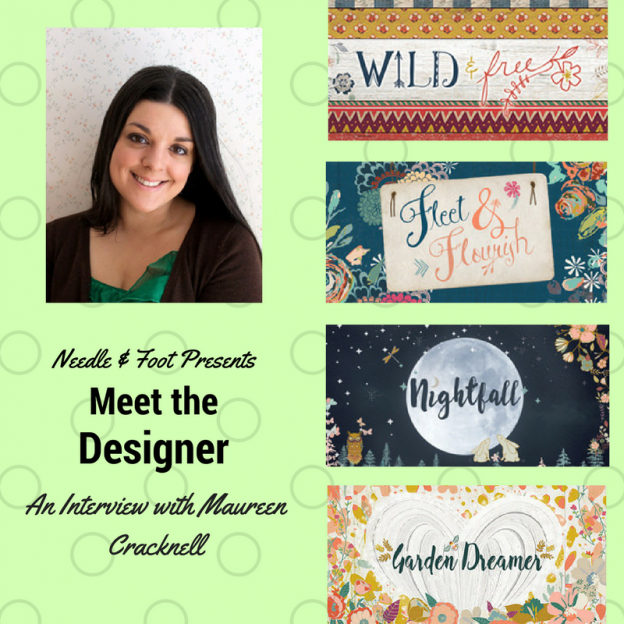 This entry was posted in Designer Interviews and tagged art gallery fabric, fleet and flourish, garden dreamer, lookbook, maureen cracknell, wild and free on March 15, 2017 by Bernie. Bernie, another superb post! Art Gallery needs you on their team as a reporter – I’m serious. The story about how Maureen got started was so inspirational I got goosebumps. I love that you did more than interview Maureen but gave background and information about Art Gallery. The photo you have of the designers led me to explore Bari J and Katarina Roccella, and I was happy to recognize their prints and put the faces with the fabrics. This is a really good aspect of your blog – loving it! I have to agree with Linda here, thank you so much for this second part of the interview Bernie!! This is my second time in your blog and I subscribed after yesterday’s post!!! There were so many new things about Maureen’s inspiration, motivation and personal stories!! And the picture of the designers is so pretty!!! For me living in Greece and reading such great stories and getting to know my favorite designers better is so inspiring!! Thank you again!! Looking forward to future posts and need to go through your old ones too!! I really enjoyed learning about the path Maureen has taken to get where she is and it makes me excited to continue to follow her and watch her progress. It is so nice to meet you and to make a new friend in Greece! Very interesting Bernie! I wish I could translate feelings into art like that. Wouldn’t that be wonderful? I really admire people who can draw and/or paint. I have zero abilities when it comes to that sort of thing. I looked at the posts at the beginning of Maureen’s blog and her drawings are just beautiful – this has clearly translated to beautiful fabric. Bernie, this was a really great 2-part post. Thank you for sharing! Hi Bernie I have really enjoyed reading the 2 part interview you had with Maureen. It must have been wonderful chatting about all of this with her. I look forward to reading more of your interviews.